Stock photo of the Clock Tower of the Old City Hall and a modern building in downtown Toronto at dusk Ontario Canada. 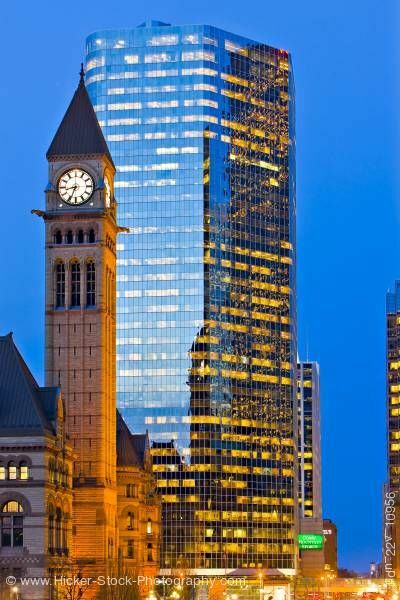 Old City Hall with modern high rise building in the background at dusk in Toronto, Ontario, Canada. Clock Tower of the Old City Hall and a modern building in downtown Toronto at dusk, Ontario, Canada. This stock photo shows the tall Clock Tower of the architectural interesting old City Hall with a modern high rise building in the background at dusk. The Old City Hall is located in downtown Toronto in the Canadian Province of Ontario, Canada.